Erin is an Associate in our litigation group. Erin appears at all levels of the Superior Court of Justice, including the Small Claims Court. 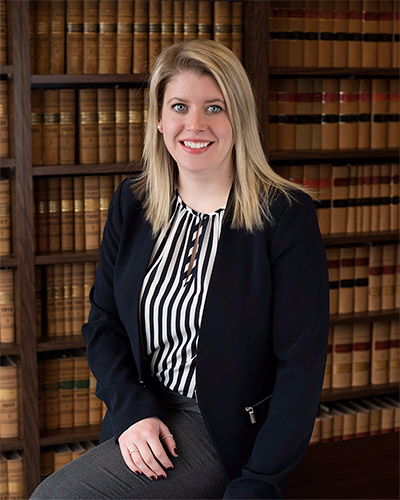 Erin graduated from the University of Waterloo with a Bachelor of Arts (Honours) in Legal Studies and Political Science prior to receiving her Juris Doctor from the University of Windsor. While attending law school, Erin volunteered at the Community Legal Aid clinic in Windsor. Erin articled with Madorin, Snyder LLP and joined the firm as an associate following her call to the bar in 2016. Erin was born and raised in Waterloo Region, and is now a proud resident of Kitchener. In her spare time Erin enjoys travelling, spending time at the cottage, and trying new restaurants in Waterloo Region.